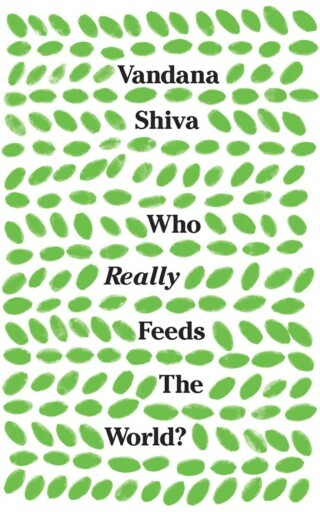 Satyagraha Foundation » Blog Archive » Book Review: Vandana Shiva’s Who Really Feeds the World? Shiva’s book describes two dominant paradigms that drive food economies across the globe: those that follow the Law of Exploitation, which prioritize the profits of large corporations; and those that follow the Law of Return, which situate farming into a holistic understanding of ecological and communal integrity and flourishing. She uses this basic dichotomy in each chapter to frame a series of related dichotomies. The introduction and the first chapter also remind the reader that, despite industry’s repeated insistence that the world needs industrial agriculture, in fact, small farms using holistic, agroecological methods produce more food per acre and provide 70 percent of the world’s food. Outbreaks of pests are symptoms of a system that is out of balance; instead of deepening the imbalance by introducing more deadly poisons to kill pests, we must restore the natural balance of pollinators and pests, and thus restore health and nutrition in our food and sustainable life in our ecosystems (41). This holistic analysis provides the key to Shiva’s argument: regardless of the promises of high yield variety seeds or drought resistant, genetically modified seeds, farming methods already exist that address the challenges faced by communities confronting hunger and climate change. These agroecological methods continue to be unknown or even maligned simply because they will never reap huge profits for the large corporations driving their version of the Green Revolution and other forms of industrial agriculture. In subsequent chapters, Shiva ties together agroecology and Gandhian philosophy with various aspects of social justice. In Chapters 5 through 7, she describes the effects of corporate monopolies, government grain subsidies, and free trade agreements, which have devastated small farms and communities and led to widespread, global poverty and protests – even to the point of the protest suicide of Korean farmer Lee Kyung Hae at a WHO demonstration in 2003 (92). In contrast, well designed collaborations between government and local farming economies lift communities out of poverty through the creation of a resilient network of livelihoods that respect the dignity of both the human communities and the land and all its creatures. Chapter 8 specifically addresses the important contributions of countless generations of women farmers around the world, whose methods follow the ideas of the Law of Return, as well as the ways these women’s contributions are suppressed and maligned in systems that follow the Law of Exploitation. Shiva cites a Food and Agriculture Organization (FAO) report that stresses the reality that “Women Feed the World,” (fao.org, 1998) and she describes how Navdanya and others have used Gandhian strategies of Satyagraha to resist and defeat unjust and sexist agricultural laws and policies. Shiva pulls no punches as she describes the grim consequences of industrial agriculture on the lives and livelihoods of millions of people today. From Shiva’s perspective, the Earth and each community faces a life or death choice between small, agroecological farms, which build community and resilience, and industrial agriculture and free trade, which lead, in her view, to genocide. While she tends to paint all large corporations with a sweeping brush of condemnation, her vitriol is understandable given the “white savior” attitude of scientists and philanthropists such as Bill Gates, who propose to “save the poor” and “feed the hungry,” for example, through one kind of genetically modified banana (135), when plenty of biodiverse alternatives already exist to address the challenges these communities face. It may be that some individuals and corporations genuinely want to help struggling communities, regardless of profit; but Shiva spares no time reaching out to these groups – despite their good intentions and even positive results, her question remains: if agroecological alternatives exist, why do corporations and governments not instead seek to support and strengthen these local networks and sources of knowledge, instead of looking for magic bullets and a technological fix? And her question is a good one: why, indeed? Her final chapter reminds us that Shiva’s vision is far from naïve or utopian: currently, she reminds us yet again, 70 percent of the world’s food still comes from small, biodiverse and agroecological farms. She outlines nine principles through which communities can make the transition away from systems that represent the Law of Exploitation and toward resilient systems that embody the Law of Return. In the main, she summarizes the arguments of the previous chapters, in which she identifies the problems and puts forth alternative solutions: give people agency and rights, not corporations; protect seeds in the commons, not as private or intellectual property; nurture biodiversity instead of monocultures, livelihoods instead of false productivity claims, and real food instead of commodities; support local food webs, instead of long transport food chains, and fair trade prices instead of corporate profits. Lastly, she ties all these ideas together with the basic concept of cooperation instead of competition: we must learn to cooperate with one another and the Earth itself, and this philosophical approach leads to the kinds of foods and relationships that bring healing and restoration. Shiva closes her book with inspiring examples of how Navdanya has successfully reached hundreds of thousands of farmers, created strong urban to rural food networks, and helped families and communities reclaim their ancestral livelihoods. It is hard to criticize Shiva for romanticizing the pastoral life, as so many local food advocates do, when she has worked so long and so intimately with so many farming communities; she convincingly presents the possibility that families who have worked the land for generations often still find pride, fulfillment, and dignity in farming – so long as they receive the governmental support they deserve. In the same way that Gandhi lifted up spinning wheels and homespun khadi, her book authoritatively lifts up seeds and sowing as a subversive, effective means to non-violent eco-justice, proclaiming, “Our work at Navdanya shows that we must make peace with the planet to address hunger… we do not grow commodities; we grow the Earth community: in the mind and on the land” (151). One can only hope the seeds of her writings continue to take root and grow this powerful movement around the world. EDITOR’S NOTE: Tallessyn Z. Grenfell-Lee received her doctoral degree in Ecological Ethics from Boston University School of Theology. Her dissertation, “Creation, Food, and Ecological Ethics: The Garden as Mediation,” examined the potential of congregations to heal the Earth and build communities grounded in ecological peace and justice. She has written, “When churches cultivate vegetable gardens, their communities are strengthened through a greater commitment to eco-justice…. Cultivating a sacred relationship with ‘The Garden of God’ can overcome our alienation from nature and from one another.” Grenfell-Lee is temporarily living in Switzerland with her family, where she continues to contribute to the eco-feminist liturgical movement as well as explore theologies and practices of permaculture. She received the Carr Scholarship in Science and Religion (2014) and holds an M.A. in Molecular Biology from Harvard University, and an M.Div. from Boston University School of Theology.